Thinking about Christmas recipes, the first think that comes to my mind is Panettone. Been the third generation of Italian immigrants that settled down in Argentina, I inherited the love for this Italian Christmas treat. Today, Panettone is a must at Christmas and New Year time not only in Italy but in countries such as the United States, Colombia, Peru, Bolivia, Brazil, Paraguay, Uruguay, Chile and Argentina. •	as a Good Wishes treat to enjoy with a glass of sparkling. It is also a tradition that employers offer edible presents to their employees during this time: a Panettone is never missing in those well expected Christmas boxes! This treat was born in Milan, many years ago. Historians have not been able to agree on the exact circumstances that led to the birth of Panettone. But what historians agree upon is that the Panettone as we know it today originated around the 15th century, and that it wasn’t until the 18th century that the first link between Christmas and Panettone was found in some writings of that period. There are different legends about the origin of Panettone, but all have a common element: the wish to impress!! •	The young Ughetto, a falconer nobleman at the court of the Duke of Milan Ludovico Sforza, trying to impress Adalgisa, the beautiful daughter of the town baker, Toni. •	A kitchen boy , also Toni, trying to impress the Duke and his guests at one of Ludovico’s Banquets when the main dessert got ruined, saving the master chef’s fate on the way by improvising on the leftovers. •	Sister Ughetta trying to impress the other young nuns of her convent. For those interested in more details of the Panettone history, "Panettone a due voci" (Carlo Cracco, Davide Oldani) is a must! 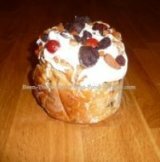 Nowadays, Panettone is basically a sweet and rich cupola-shaped bread that contain mainly raisins, candied fruits, nuts, etc, or just chocolate chips (more popular with children). 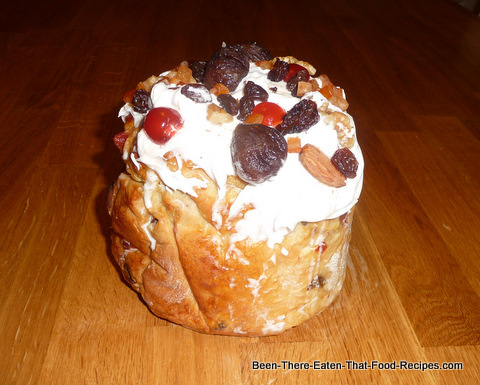 The top of the Panettone can be decorated with candied fruits or fruit peelings, figs, cherries, you name it! And covered with royal icing. Otherwise, it can just be dusted with icing sugar for a finish that is very easy to achieve and no less dramatic. You could use fresh or dried yeast for your Panettone. If it is practicality what you are after, the dried yeast is for you. But if you are a fresh yeast fan, here is your chance to show off!! Either way, make sure that your chosen yeast is not out of date, otherwise your dough is not going to rise! Using your fingers or a mixer, dissolve the yeast in the warm milk on a warm bowl (previously rinsed with warm water), add the sugar and dust the flour on top, stirring altogether. Cover with a tea towel and let sit until looking foamy. Stir altogether in a warm bowl, beat it , cover with a tea towel and then let it foam for about 10-15'. After that, beat again and your yeast is ready to use. Remember: apart from what is needed for the basic dough, all the extra luxuries are optional. Choose your favourites treats, customise it! Tip: if you don’t have a kitchen scale yet, please please get one of those inexpensive flat digital ones! It will change your kitchen life, believe me! You can measure ingredients in different units, deduct the weight of the containers, or keep on adding into the same container (ie, mixing bowl) just deducting the previous content and starting to measure from zero. So practical, you will never regret it! Moulds: you can buy Panettone paper moulds, make them yourself out of baking paper, or simply use an empty tin (cookies', coffee's, etc, lined with baking paper). Previous night: re-hydrate your raisins, plums, and any other dried fruit you may have chosen, in the cognac. Next morning, start by preparing your yeast (fresh or dried) as indicated above. Now prepare the dough: beat on a mixer the butter and the sugar until soft looking. Add the eggs, the lemon and orange zests, the cognac, the extract of Malta, the orange blossom water and vanilla essence. Mix everything and add the warm milk, the foamy yeast and the flour. When all mixed very well together, remove from the mixer and knead the dough on a floured surface, knead and keep on kneading. The dough must be sticky and soft. Place the dough in a lightly oiled bowl, cover it with a tea-towel, place it on a warm place and let it to rise until it doubles or triples its volume (anything from 3 to 6 hours). After that, knead again and make a cylinder and add all treats to the dough (almonds, nuts, fruit etc), making sure you spread them along, and roll the dough with its content. With your hand, cut small buns, knead them one by one, and then return to knead them all together, so that the treats integrate themselves. Tip: to avoid the fruits from going straight to the bottom, place flour in a bowl, add the fruits in small quantities, and move them around the bowl until completely covered in flour. Take the extra flour out of the fruit and add the flour-covered fruits to the dough. If you have chosen to use an empty tin, butter it and then line it with baking paper, leaving an extra 3cms coming out of the top of the tin. If you have chosen to use paper moulds, you don’t need to butter them. Tip: I made the moulds myself with baking paper, trying different ways. The best moulds were those I made as follows: take some cylinder shape as reference (i.e. a cylindrical flower vase), and cut 2 rectangles of baking paper long enough to wrap around the cylinder. Also cut a round piece of paper big enough to cover the base of the cylinder adding 1 cm to the diameter. Place the cylinder centrally on top of the round piece of paper and mark the cylinder contour with a pencil. With scissors make small cuts from the outer border to the inner (cylinder’s diameter), to make wings that have to be glued to the inner sides of one of the rectangles to form the mould. Glue the ends of this rectangle together. Glue the ends of the second rectangle and place it inside the paper mould, making sure that the union of one rectangle is located opposite the union of the second one. This is to avoid that, if the inner mould succumbs to the pressure of the rising dough and the union gets open, the second rectangle will cover the gap and keep the shape. In both cases, fill only up to half of the moulds' capacity and let them rise again. Once in the moulds, cover them with a tea towel and let them rise for a second time in a warm place, until dough is coming out of the top of the moulds (~3 hours). You could let them rise overnight in the fridge, but must bring them to room temperatures next morning before baking them. If you want to stick to tradition, before baking make a cross cut at the top of the Panettone with 2 scissors strikes (custom inherited from Sister Aghetta...). Brush the Panettone with the egg beaten in the milk. Set the oven rack in the lower setting, and bake the Panettone at 170C. (150C if fan-assisted) between 40 to 55 minutes depending on moulds size. Once baked, decorate the top with royal icing and add cherries, almonds, nuts, marrons glace, etc. Or keep it simple by just dusting some icing sugar on top. Leave them to cool down. Before serving, remove the baking paper and cut into wedges.